MIDDLE: Nenahnezad is in an idyllic location in the valley of the San Juan River. The area has been farmed for centuries. 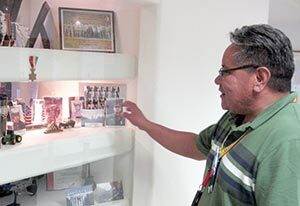 BOTTOM: Nanahnezad Chapter Community Services Coordinator Arthur Bavaro shows off the “veterans’ showcase” inside the Nenahnezad Chapter House. When the anti-coal folks start listing the health detriments of breathing smoke from the Four Corners Power Plant, Nenahnezad Chapter's community services coordinator, Arthur Bavaro, has a ready response. "You know what's really bad for your health?" he asks them. "Poverty!" This relatively prosperous chapter on the banks of the San Juan, with its tidy farms and well-maintained houses, looks pretty much like any off-reservation suburb of Farmington. And that, says Bavaro, is thanks to coal. Both the Navajo Mine and the power plant are located here, and along with their attendant service industries, they employ about half the chapter's working-age population. The ones who aren't working are probably in school, also courtesy of a certain black rock. Between Navajo Mine owner BHP Billiton and the companies that co-own the power plant, almost every Nenahnezad resident who wants to further their education -- Bavaro produces a three-page list of the current recipients -- can get a corporate-sponsored scholarship. "People talk about the 800 jobs we would lose if the mine and the power plant shut down," Bavaro said, "but what they don't realize is all the other benefits we get from these companies, like the scholarships. We're one of the best-educated chapters on the Navajo Nation, thanks to them." So you can bet all eyes in this picturesque river valley are on the Navajo Nation Council right now, and the impending purchase of the Navajo Mine by a new tribal entity. While Nenahnezad is grateful the tribe is stepping in to ensure that the mine and the plant continue operation, the residents are a little apprehensive too -- partly because the negotiations have been confidential and the chapter hasn't had a seat at the table. "We have a really good relationship with Billiton," Bavaro said. "We don't know anything about NTEC (Navajo Transitional Energy Co.). It's like you're getting a new neighbor. You wonder, 'Will they be church-goers or partiers?'" Even without the coal, however, this would be a fortunate chapter. It has water. From the long, gradual road leading into the valley -- "Nenahnezad" means "long incline" -- you can see the irrigation pipes watering the just-cut hayfields. "This community is primarily farmers," Bavaro said. "I remember once looking at a calendar from the Special Diabetes project that had pictures of all the food crops grown by Navajos. I could identify most of the pictures as being from this area." The chapter tries to support its agriculture, Bavaro said, but not to the point that it competes with private entrepreneurs. For instance, he said, "We'll cut their hay, but we don't have a baler. There's some people who already offer that service; that's their living." One group the chapter makes a big deal of is its veterans. The spacious chapter house includes a "veterans hall," draped with camouflage felt and other military camp accoutrements. "The veterans feel at home here," said Bavaro, a veteran of the U.S. Marine Corps. Name: While many chapters are changing from English to Navajo names, "We've always been Nenahnezad," said Community Services Coordinator Arthur Bavaro. The word means "a long incline." 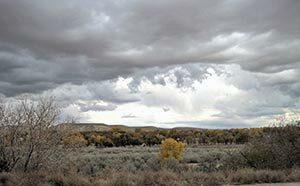 The road to this community is the most gradual approach to the San Juan River in this area. But, in spite of the industries located here -- in addition to the coal mine and power plant, the Running Horse crude oil pipeline runs right under Nenahnezad -- there are still some very undeveloped areas of this chapter. Some of Nenahnezad's residents didn't get electricity until 2005. "Boot camp was the hardest thing I ever went through," Bavaro said. "Getting the power line extended beyond the power plant was the second." The problem, he said, was that once you get away from the riverbanks, Nenahnezad is a very spread-out community, with five miles or so between homesites. NTUA just couldn't justify the cost of running the line. Fortunately, the Four Corners plant provided the necessary sense of irony. "We had reporters here from the New York Times and the Washington Post, taking pictures of houses without electricity, with the power plant in the background," he said. Tired of his home state being embarrassed in the national press, then-U.S. Sen. Jeff Bingaman (D-N.M.) was able to obtain federal funding to jump-start the project. "We had a big Christmas-lighting ceremony at our secretary-treasurer's house," Bavaro recalled. "She died a little while after that." Currently, the chapter is in the process of extending a water line to those scattered homesites, but again, it's a huge expense. In other projects, the chapter is lobbying the Navajo Division of Transportation to re-align the dangerous, perpendicular turnoffs from N36 into the chapter. One of the most intriguing new projects, however, was not initiated by the chapter, but by one of its youth. Chantel Toyebo, a Kirtland Central High School student, recently approached Bavaro about the possibility of developing a youth council to advise the chapter on youth issues and take on service projects. "I told her, 'Come back with a vision statement and some goals,'" Bavaro recalled. "I didn't think I'd see her again." Darned if she wasn't back in a few days. "I guess I'd better be prepared to open the chapter house and attend some extra meetings," chuckled Bavaro. "The last thing I'm going to do is turn away the young people, if they want to be involved."